Recently, Kevin Randle produced a blog entry discussing the infamous Chiles-Whitted sighting.1 He argued that the case was probably a meteor fireball, where the pilots mistook the bits of debris breaking off as windows on a large craft. This has been the classification of the case by most skeptics and project Blue Book. I had thought that a majority of UFO proponents would have ac- cepted this kind of explanation based on the evidence presented to date regarding space debris re-entries and fireballs. However, the response by several commenters, and on other blogs, indicated that they considered such an explanation absurd. As a result, I felt it would be a necessary to present the case and where I think most of the arguments against the fireball explanation are wrong. ...We were cruising about 20 miles southwest of Montgomery, Ala..” said Chiles, who was an ATC ferry pilot for four years during the war. “Then I noticed the two rows of square windows—-it was a man-made thing, all right. ‘ We couldn’t see any people aboard. It was trav- eling too fast for that. Whitted, who said he had seen the air force’s best jet planes not on the secret list, estimated its speed much faster than any craft he had seen before. Whitted was a B-29 pilot during the war. As the aircraft passed them, their DC-3 fluttered in the “prop wash, jet-wash or rocket-wash,” the pilots said. “It sent out tremendous shock waves.” The brilliant light of the airship and the flame of its propellant brought “lightning blindness” to their cockpit, the pilots said, and they had to turn up their instruments lights to read them. 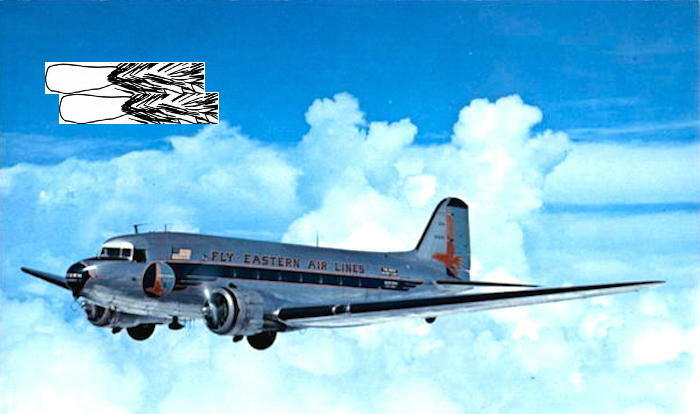 On the evening of July 24, 1948, an Eastern Airlines DC-3 took off from Houston, Texas. It was on a scheduled trip to Atlanta, with interme- diate stops in between. The pilots were Clarence S. Chiles and John B. Whitted. At about 2:45 A.M., when the flight was 20 miles southwest of Montgomery, the captain, Chiles, saw a light dead ahead and closing fast. His first reaction, he later reported to an ATIC investigation team, was that it was a jet, but in an instant he realized that even a jet couldn’t close as fast as this light was closing. Chiles said he reached over, gave Whitted, the other pilot, a quick tap on the arm, and pointed. The UFO was now almost on top of them. Chiles racked the DC-3 into a tight left turn. Just as the UFO flashed by about 700 feet to the right, the DC-3 hit turbulent air. Whitted looked back just as the UFO pulled up in a steep climb. Both the pilots had gotten a good look at the UFO and were able to give a good description to the Air Force intelligence people. It was a B-29 fuselage. The underside had a “deep blue glow.” There were “two rows of windows from which bright lights glowed,” and a “50-foot trail of orange red flame” shot out the back. According to Ruppelt, it was this case that pushed ATIC into writing the infamous “Estimate of the situation”, where they concluded UFOs were interplanetary spacecraft. Ruppelt’s version of events was considered gospel because it was supposedly based on what Blue Book had in its files. Unfortunate- ly, Ruppelt’s version appears to be more a replication of the media accounts than anything from the Blue Book record. 3. Duration was described as short as 5 seconds6 and as long as 15.7 The consensus appears to be closer to 10 seconds. The rest of the story is pretty much the same but this information can help in evaluating some of the observations. Two other witness were pilots near the Virginia border. Both reported a sighting around 0230 AM EST. This is close enough to the Chiles-Whitted sighting to be considered related. The first witness was an Eastern Airlines crew located between Blackstone, Virginia and Greensboro, North Carolina.14 They saw what they thought was a the meteor to the southwest (approximately 210 degrees azimuth). It was seen traveling horizontal above the horizon and then faded out. Near Blackstone, Virginia, a pilot enroute to Raleigh-Durham, also saw a trail being left by an object traveling towards the southwest (azimuth 230 degrees).15 The witness stated the object was 20 degrees above the horizon. 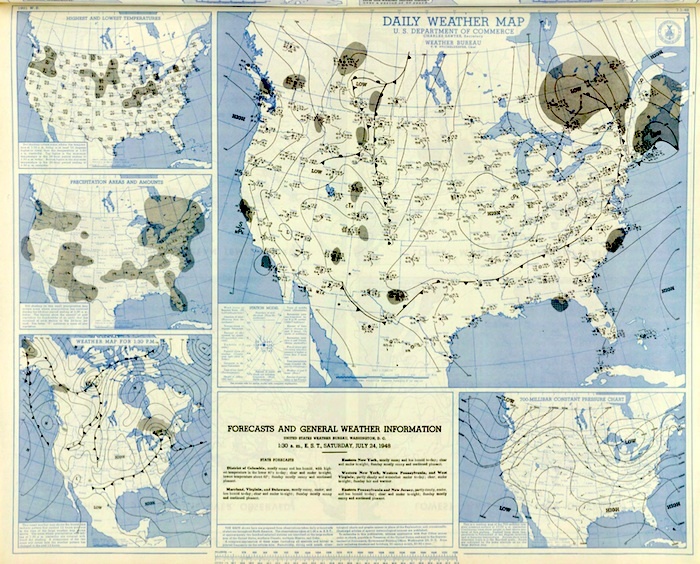 The sky conditions that night were listed by Blue Book as being 4/10ths clouds.16 We don’t know much more than that. Chiles and Whitted both stated the object went into a cloud bank, which tends to indicate that the some of these clouds were behind the aircraft. The passenger stated they could see the moon and only saw passing cumulus clouds. Selma (45 miles to the Northwest of the aircraft) had rain before 0200 and after 0300 but was clear during the critical time period. All of this information tends to indicate that the clouds were mostly to the east and north of the aircraft. There probably were scattered cumulus clouds in the area but one could conclude that the skies were probably “mostly clear”. Blue Book eventually determined that this event was produced by a bright fireball. This was supported by the evidence obtained in the Zond IV incident, where some witnesses gave descriptions re-entering space debris that were very similar to the descrip- tions given by Chiles-Whitted. are a lot more common than UFO proponents want everyone to believe. In a recent incident, an Air Force aircrew landed their trans- port plane at the wrong airport!20 These kinds of events can not be dismissed with a wave of the hand. The “pilot’s are too reliable” argument ignores what is known about pilots, pilot error, and UFO reports. Other arguments against the fireball explanation is that the meteoroid that produced the fireball had to be enormous in order to produce a bright fireball that lasted 10 seconds. This is not true. We have no magnitude estimates for the event other than it was bright enough to create a flash of light. This sounds like a brightness of about -8 to -12, which will cast shadows in illuminate the sky around them. Looking at the AMS database, one can see that such meteors are seen often enough to indicate that they are not a “rare” event. Then there is the argument that meteors normally do not break up. Looking at the American Meteor Society (AMS) data21, such fire- balls are frequent enough to be possible. For the United States, there were 3175 fireball reports from the year 2015. 1120 of them were of the fragmenting type and many of them were estimated to have magnitudes greater than -8. There is also the argument that the duration of the event was too long to be a fireball and that such fireballs are very rare. Dura- tions of the various fireball events described in the AMS database varied. Some reports contained durations as high as 20 seconds but these may have been erroneousness. While the bulk of the sightings had time durations of five seconds or shorter, there were enough observation of fireballs with durations of about 10 seconds to indicate they were not that unusual. These arguments against the fireball explanation are based more on belief than careful examination of what is known about fireball meteors. Contrary to what has been stated, a fireball meteor seems like a possible source for this UFO event. A good reason to suspect that the sighting was of a fireball is based on the data found in the Blue Book file. When one plots the observations made between 2:30 and 3 AM that morning, there is indication that the observers were all seeing the same event. These observations create an approximate path of the potential fireball (red track). While one might think it would be impossible for the two aircraft in Virginia to see the fireball in Georgia/Alabama, one should check out the meteor meniscus web site created by James Richardson.22 The two aircraft were roughly 900-950 km northeast of Chiles-Whitted. For a meteor at standard altitudes, it would have been a few degrees above the horizon. While one of the pilots gave an altitude of 20 degrees, it is possible he over- estimated this. The magnitude of the meteor would have been 7-8 magnitudes dimmer than those directly beneath the fireball. This means that -8 to -12 magnitude fireball would have been about 0 to -5 from Virginia. This still would have been an impressive meteor. The witness at Robbins saw his meteor an hour before but there is one document in the file that suggest his observations might have been an hour later!23 He saw the object come from the north and go southwestward. He also mentioned it went overhead but an object at a significant angular elevation can often be misinterpreted as “passing overhead”. Of course, the big question is why Chiles and Whitted tended to indicate the fireball passed at a low elevation by their plane. Is it plausible that their interpretation of the object being close proximity gave them the impression that object was close to the hori- zon? In the Ruppelt account, the pilot made a tight bank to port. If they did bank their aircraft to port, it might have given the false impression the object was close to the horizon because of the raised starboard wing. The passenger implied the object was higher in the sky than the plane, which meant there may have been a higher elevation angle than low on the horizon. Since we never re- ceived any firm elevation angles for the object, it seems possible that it was much higher in the sky than near the wing of the aircraft. One can not be sure of these observations or interpretations but there is a possibility that a bright fireball might have fit the obser- vations that morning. While it is hard to ascertain the amount of meteor activity on the date in question, one can look at meteor data to determine the amount of fireball activity for that time of the year. NASA has a meteor network that operates cameras in three regions of the US. One of these regions happens to include the area of Tennessee, Georgia, and Alabama. The entire network has its data readily available at the Spaceweather.com website.24 I went back to the last two years on the days of July 22-26 to see what the general fireball numbers were. These sightings were only from three areas but the American Meteor Society25 has a database that encompasses the entire United States which might help narrow down some specifics regarding each fireball. I decided to examine the database for 2015 and look for fireballs that fragmented and see if they generate UFO reports of the type Chiles-Whitted reported. Do fireballs generate these kinds of reports? balls. While several of the events were possible matches, there was one incident that agreed in both data bases. 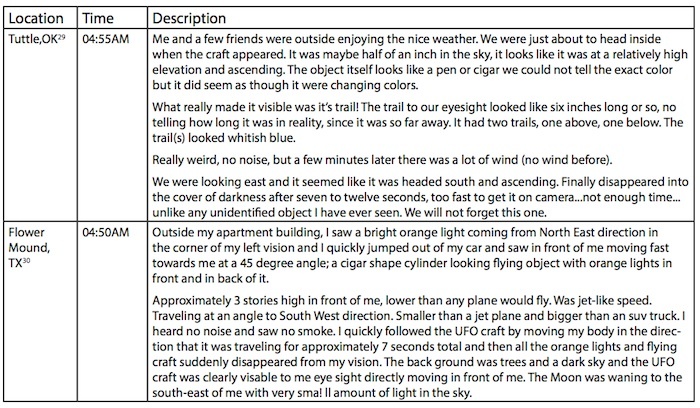 On June 10, 2015, there were three UFO sightings near Texas at roughly 0450 AM describing cigar like objects. The American Meteor society has event 1319-201528, which had 8 observers reporting a fragmenting meteor of about magnitude -8 at 4:47AM. It was seen as far north as St. Louis and as far south as Yantis, Texas (east of Dallas). Other observations were in Louisiana, Arkansas, and Oklahoma. These kinds of observations are very similar to Chilles-Whitted although they did not specifically describe seeing windows. Each fireball is unique and the perception issue which produces the “airship effect” will depend on the individual and the circumstances. There are other examples in UFOlogical databases. This that evening, a bright fireball was seen over the north- east. There is no doubt that it was a bright fireball and it was widely photographed. Despite the public an- nouncement that this was nothing more than a bright meteor, some witnesses thought it was something else. The witness’ sketch shows the fireball as it appeared initially followed by the subsequent fading out as the remaining fragments of the fireball continued on its tra- jectory as it faded out. The created the “portholes” (aka windows) on the craft. sketch was made on April 25, 1966 by a UFO witness in Pennsylvannia.32 On the craft. that are similar to the Chiles-Whitted sighting and that these fragmenting fireballs that generate such reports are not rare as some implied. We can’t say for sure that the Chiles-Whitted sighting was positively a fireball because we do not have a time machine. That be- ing said, the history of how fireballs are misinterpreted as UFOs and that some can be described the same way Chiles-Whitted described their UFO indicates that it was probably a fireball meteor of some kind.